The winter solstice just passed a few days ago. I'm always relieved to know that the sun will be around a little longer now each day. Hibernation makes eminent sense this time of year. Hibernia was a name given to Ireland by the Romans; no one seems sure whether this wasn't their assumption that it was perpetually wintery there or if it was just a linguistic warping of earlier names for Ireland. In any case I'm writing this in dry sunny Colorado, far from Ireland but still feeling the pull. I'm hoping that the turn of the planet will throw new seeds and birdsong from my fingers. It's been a low ebb. Oh, and the painting: this is a watercolor done about a year ago based on two weeks of daily conjurings of Ireland; it's watercolor on paper 10″ x 14″. Some time during the late 1980s, it would have been during the DKD years, I began to experiment with arranging landscape elements and deliberately scrambling their expected locations on the page. I was doing this while painting outdoors. It's liberating to realize that you can put anything anywhere you want. (This might be true in reality altogether, but watch out!) It is said that reality is infinitely more flexible than we can imagine. Painting is a direct and generally overlooked means to encounter this unnerving mutability of experience. This approach has little to do with “expression”; in fact, it may have nothing at all to do with parading emotional responses of any kind. Ideally this is a form of play, a patient and considered arranging of things guided by a purely intuitive search for what is both right and unexpected. 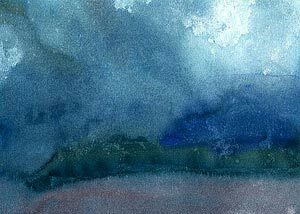 This watercolor is 7″ x 14″; it was the basis of a much larger painting that I left unfinished sometime in the late 80s. By the way, “Huerfano” is the name of the county in southern Colorado where this was painted. There aren't many wild places left along the coasts of Florida. Hutchinson's Island still has a long stretch of beach bordered by mangrove swamp and palmetto groves. Many winters during the 1980s and 90s we visited my wife's parents there. It was a productive time for watercolors. I also have fine memories of those visits. I've always admired my parents-in-law for their effortless glamour, and escaping the dank New England winter to visit a steamy, sub-tropical island always seemed too good to be true. This place in Florida seemed to me to be the fruition of my parents' generation. They got through the Great Depression, fought and won the worst war, raised their families in a time of prosperity, and then settled into hard-earned retirement. 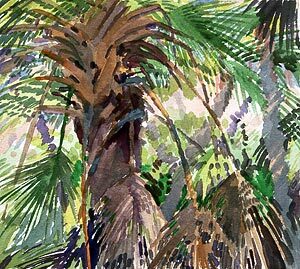 The palm grove in this watercolor is now gone, washed away in hurricane somebody; my father-in-law Jim Anderson died on Monday at 94. He and my mother-in-law Janet have been living with us this past year, so we had the honor and duty to accompany him to his final exit. A decorated veteran of the Second World War, he was wonderful story teller, a down to earth friend and family man, and a personal hero to me. His life, and all of our lives, like the thin barrier islands off Florida's Atlantic coast, are only temporary; and appreciating the inexplicable accident of our encounters ends up being the stuff of life itself. Ishfindatl lies just west of the Outer Hebrides, perhaps the most remote of the many uninhabited islands claimed by both Scotland and Denmark. The annual rainfall sometimes exceeds 500 inches. Archeologists have unearthed evidence of primitive human settlements dating back to megalithic times; more recent settlements in the sixth century of the current era appear to have been short lived. Ishfindatl has for millenia been a primary nesting ground for puffins, cormorants, and gannets, whose numbers have been known to exceed 35,000 nesting pairs in one season. Ishfindatl is also an occasional breeding ground for the Band-Rumped Storm Petrel. I was able to spend a few weeks of terrifying solitude there in a hut improvised with driftwood and kelp, surviving adequately on the abundance of bird eggs and edible herbs. The painting here is a small watercolor recollection of that adventure. It's 6″ x 9″. 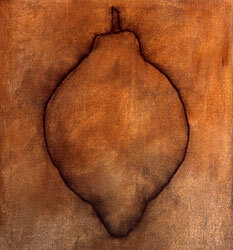 This painting is sometimes paired up with a very similiar rendering of the same squash. Sometimes when I'm painting I reach an impasse somewhere in the middle where I'm not sure what to do next and I worry that I'll lose my nerve or just screw it up. Instead of forging blindly ahead (which by the way is another option) I've found myself taking out another canvas and re-tracing the steps of the first painting right on the surface of the second. Then I have two paintings at the same juncture. One of them is then the sacrificial lamb; if I ruin it, at least I find out what I shouldn't have done. This is one of the pleasures of painting: you can set up alternate universes that allow flexibility of decision-making. I suppose it's the same logic behind computer simulations and any kind of model. In the approach I'm describing here, what often happens is that I end up with two reasonably good paintings whose existence is something like that of twins. So I'll display them as diptychs. In fact, here's this one with its twin! This canvas is 38″ x 42″. I just returned from my first trip to India. Most of my time there was in the state of Himachal Pradesh, which sits in the Himalayan foothills. The summer monsoon rains were just tapering off when I arrived and the air was moist, lush greenery everywhere. I would like to say that this painting is of the sun coming over the steamy foothills. It isn't. I did it more than a year ago in my Boulder studio. In fact, I did very little painting while I was in India. The visual scene was so unlike anything I've ever encountered that all I could do was gawk and muse. I had a series of grand ideas about cataloging the plants and flowers, or maybe the butterflies, or perhaps the birds, or how about the Tibetan monasteries? All of these ideas soured like the contrived schemes of a bogus explorer. So I just sat still. Visiting a foreign place makes you realize how much you don't know and how much the same everything is everywhere. 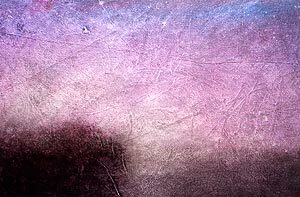 It can also stir the insight that phenomena are dream-like and ephemeral, that nothing is ever what we think. These are called Queen Anne cherries. 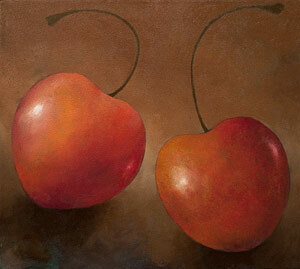 I was looking for some bing cherries to paint but this was all they had at Peppers Plus farm stand in Pueblo. The occasion for revisiting my “fruit guy” mode was a commission to be presented to a friend on the occasion of her retirement. Well, it wasn't really a retirement, exactly. It was one of those departures of an unusually dedicated manager trying to work under new leadership. Why does this happen? I've got my theories to keep me warm but let's not go into it. There is a simple compositional puzzle here of arranging two objects in a space. You can do it with two, three, or any number you like. Composition seems to be an inner sense of what is “right” about how something is located. A lot of theories and customs have been propounded over the centuries, but when it comes down to it, formulas are more likely to obscure the naturally arising sense of things or our ability to recognize and handle inherent qualities. Harmony and dissonance are elements of both a painting and an organization. In both cases it's easy to find them spinning out on their own; in a minute we can be off the tracks, or find ourselves off the train altogether. It's a good thing that the train is only one among trillions of worlds. Good luck, Susan! I hope you enjoy the cherries. By the way, all: I'm heading to India in a few days and I won't be making the usual homepage changes until I return in mid-October. I know how much this means to all of you and I regret the inconvenience. I did this painting along with several other comic book tableaux in 2003. It seemed timely to feature it here along with the release of the film Captain America: The First Avenger, now playing in theaters everywhere. This painting borrows a composition from a very early Captain America comic book, with some stylistic revisions of my own. They are crashing on their motorcycle. The full title is Captain America and Buddy Take a Spill Near Mont Sainte-Victoire, Seen From Les Lauves. The alert viewer may recognize the faint outline of Paul Cezanne's favorite mountain in the upper center panel. Les Lauves was the studio that Cezanne built and which he used for the last four years of his life. This painting is acrylic on canvas in three panels; the overall dimension is 38″ x 84″. You can see it at Art + Soul Gallery in Boulder, Colorado USA. After almost a year with little or no rain or snow it seems to be raining every day in my part of Colorado. There was plenty of snow in the mountains but somehow it didn't find its way to the foothills and flatlands. Now the snow is melting and it's raining –sometimes heavily– in a kind of meteorological Russian roulette. All it would take is a sustained downpour in the right place and we'd have a serious flood in Boulder. Meanwhile, I have to say I prefer this to drought, which is the more usual fare. This painting was done a few months ago before all this rain started; maybe it was an act of longing. There is also some connection with paintings I saw as a child — paintings of calamities delivered from the sky, like eighteenth century paintings of the biblical Seven Plagues of Egypt or spectacular disasters at sea. It feels lately that the home planet might be making moves to withdraw support for our species, which seems understandable if you look at the mess we're making. And all the while the play of light on water laden air — an endless display of careless beauty. 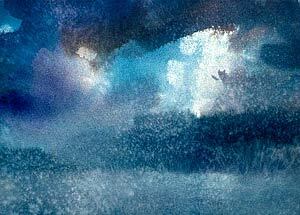 This is another in a series of details pulled from previous paintings. I'm looking for economy lately; maybe it's the state of the economy. I'm preparing canvases to do some of these on a larger scale. The image here is about eight by eleven inches. I'm thinking that something four by six feet would be about right. These smaller paintings have a quality of consonance with the materials that seems to happen in the absence of self-conscious “statement-making”. Art seems to have a better chance of going true when the attention in its doing favors the physical over the mental, the immediate over the eventual. Retrospective analysis is fine. Analysis beforehand is usually a deal with the devil. As Samuel Johnson said, “Nothing is more hopeless than a scheme of merriment.” The title I've given this painting for today is Dawn, the Rosy Fingered, one of the epithets for daybreak from the epic poetry of Homer. Maybe one day I'll do a portrait of a man with red fingers; the title would be Don the Rosy Fingered, but that's probably a scheme of merriment. 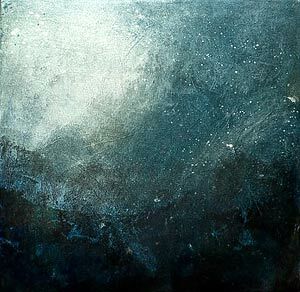 This is actually a detail of a small painting from the Helios series elsewhere on this site. 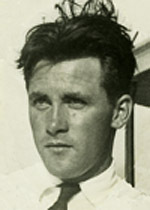 The image area is only eight by nine inches. I'm “mining” these paintings from last year for ideas for some larger work. Scale is a funny thing, particularly on a computer screen, which leaves a viewer's sense of size open to whim. The image here could be six feet or six inches high and imagining it either way seems to work. On an actual canvas, the matter of scale can be perilous. Not a few times have I done large paintings that end up looking like jumbo caricatures of their smaller, more elegant parent sketches. Scale in no way guarantees presence in the same way that loud volume doesn't guarantee musicality. But I'm always enticed by the idea of the “heroic painting”. 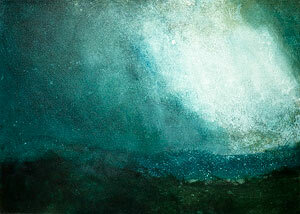 I've started work on this series, which for the moment I'm calling Sketches for the Grand Landscape. I might also call them something like Old Man Landscapes. 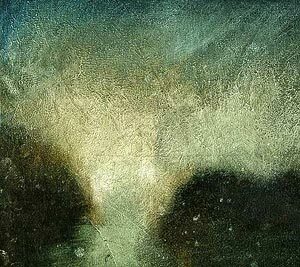 There is mawkish peril in painting light shining through aqueous substances: fruit, water, skin. But let's face it, it's a temptation worth the risk of ridicule. At the time of this painting I was subjecting myself to carefully observed still life painting. 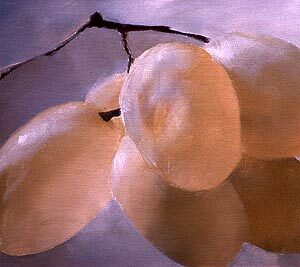 I would arrange small bundles of grapes hanging by threads at eye level such that light would shine through from behind. I'll admit that my working setup was a curious sight. Over the years I've experimented with using severely limited pallettes. This painting was done during the late 1980s; at that time I was using cerulean blue, yellow ochre, venetian red, and white. I was seeing how many colors were possible using these very untypical representatives of primary colors. Also during this period I was working on unstretched canvas at 19½x 21 inches. I'm not certain how I arrived at this arcane dimension but I did many, many paintings in this size. They end up being kind of a pain in the neck to frame but they were quick to prepare. They also suggest a square, a more elegant square. One of my first formal aesthetic experiences happened on a childhood trip to the Worcester Art Museum in Worcester, Massachusetts. I was eight or nine years old. My mother took us. I remember being astonished that some paintings looked like chaotic moosh up close, but from a few feet away were vivid, luminous scenes. I thought, “How did they know it would work?” The question still intrigues me a half century later; and it has been a regularly travelled avenue throughout my painting life: a merging of material and vision in such a way that the paint isn't dressed up to look like anything other than what it is yet it conveys or suggests an image. This painting appeared a few days ago. I had some people interested in landscape images so I took the opportunity to re-visit my “Worcester moment”. The practice of painting in this way seems to depend as much on emotional recollection as it does on visual recollection, both of which emerge in the present-moment, non-verbal engagement with the paint and surface. This one looks like scenes I've witnessed in the Rocky Mountains of southern Colorado; maybe in the Sangre de Cristo mountains. It's acrylic on canvas, 24″ x 26″. 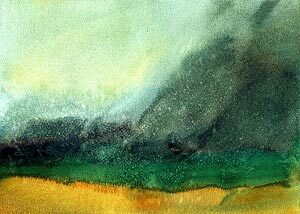 In the 1990s I did a number of paintings that were perhaps more drawings than paintings. I was finding the preliminary drawings for paintings to be satisfying enough, so I would stop there. The present painting, The Citrus of Willendorf was named after the fact because of its stylistic ties to the famous Venus of Willendorf an ancient stone figurine –probably 25,000 years old– found in 1908 near Willendorf in Austria. The Citrus appeared in a full page spread in the Shambhala Sun magazine in the late 1990s. The original painting was owned by the late mezzo-soprano Lorraine Hunt Lieberson and her husband, the composer Peter Lieberson, who died last month after a long illness. I met Peter in 1980 and we became friends. He was the first true aristocrat I ever met. During the 1980s I was the caretaker of a remote retreat place in southern Colorado. It was a little like dying and going to heaven: time, space, beauty, peace. There was plenty of work that came with the job but there was also time to paint. My fellow caretaker and wife, Joan Anderson, and I were able to engage our painting practice without distraction. The present painting –Tangerine Slice, Nut– was done during this time. Its whereabouts are unknown to me; I hope it is in view somewhere. 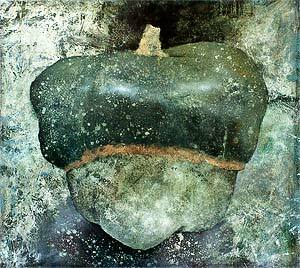 It was part of an odd series of paintings that placed fruit and machine parts together. There wasn't any intended hidden meaning to this, it had more to do with a continuing fascination with light. I don't know the exact dimensions of this painting, but it's around 10″ x 16″ acrylic on unstretched canvas. I did this watercolor last week during spring break. In the wilds of southern Colorado springtime is unpredictable. The weather can change from sunny and mild to blustery and then sudden snow. This and other paintings I've been doing this year seem to be part of a thread that weaves the materials with deeply rooted visual memory. So the painting is partly based on observation and partly on memory. Memory seems to impart something beyond what is purely observed —perhaps touching on what a situation feels like as much as what it looks like. This was one a burst of several dozen watercolors done fairly quickly. It's slightly larger than 6 x 9 inches. 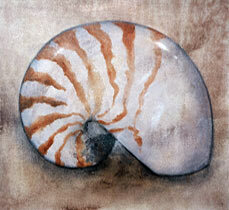 This is one a series of paintings of a chambered nautilus shells I did in the mid-1990s. This one was on unstretched canvas with an image size of 18½″ x 21″, an odd size that I worked in extensively for some years. I like the squarish shape but an actual square looks too tall. Finding the right proportion of length to width seems to be an ongoing and elusive endeavor. I sometimes compare it to the motions of a fussy dog arranging and re-arranging his bed looking for the perfect shape and effect. This painting was a harbinger of many paintings that followed a decade later. 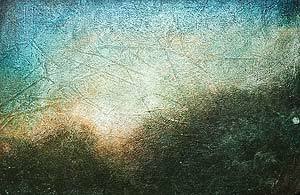 The background color and texture mimic old surfaces of the kind you might find on a wall or on a drawing that had survived the ravages of time and careless handling. The nautilus seemed an appropriate image for this month's full moon, which at perigee is as close to the earth as it has been in eighteen years. 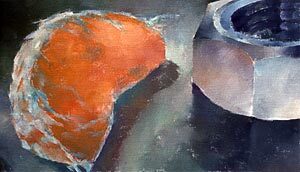 During the 1990s I did many paintings of fruit and vegetables in more or less traditional still life fashion. I was interested in developing the most basic skills of painting and drawing. At the time of this painting I was also working with a deliberately limited pallette: alizarin crimson, phthalo blue, cadmium yellow light, and titanium white. I maintained this practice for over a year. As I gained familiarity, these pigments were able to deliver nearly every color imaginable. Working with a limited palette also builds “color muscles”, a fine-tuned sense of color. These paintings (there are two) were done at the same time. I didn't intend them to be a diptych, as shown here, but why not? I believe someone in Louisville, Kentucky owns both of these. They were purchased in that city at Brenda Deemer's fine gallery, with whom I had a pleasant association. It's funny how paintings make their way in the world; they go off to places unknown and rarely write home. These are acrylic on canvas, 26″ x 28″. 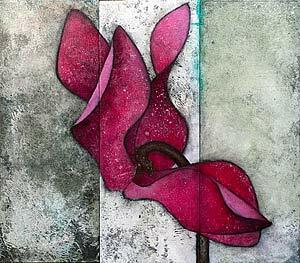 This is another of a series of three triptychs of cyclamen flowers started in 2002 and finished last month. I wasn't working on them that whole time, I just got so far with them and stopped, and then picked them up nine years later. Lately I've been scheming to do some larger scale versions of these in the form of a Chinese screen. We'll see if that happens. 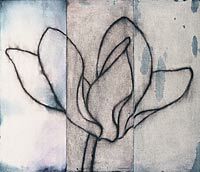 Each painting is on three panels; the overall size is 30″ x 24″, acrylic on canvas. 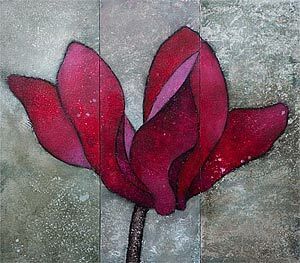 This painting of a cyclamen flower was started in 2002. At that time I was trying to pare down how I worked. I kept having the experience of making work that was much more interesting when it was about two-thirds completed than when it was “finished”. The smaller image below is what this painting looked like for most of its life since 2002. Maybe I went too far with the paring down process; when I look at it now it looks unfinished. I was asked recently by my gallery in Boulder if I had any red paintings for a red-themed show they were planning. Somehow these paintings (there are two others) called out to me, “Paint us RED! Paint us RED!” So I did. I'm pleased with them. They are each on three panels; the overall size is 30″ x 24″, acrylic on canvas. If you're in the Boulder area you can see them at Art & Soul Gallery's upcoming Red Show. 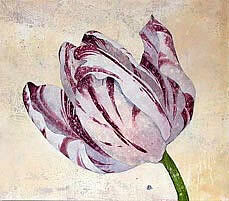 This is one of several tulip paintings I did for a show a few years back. Among the many sources I was using for reference, one of my favorites was The Florilegium of Alexander Marshall a book of botanical illustrations by a seventeenth century English gardener named Alexander Marshall. Marshall was not formally trained as an artist, but he was apparently free from money worries and hobnobbed with many of the leading artists and botanists of his day. I frequently use images from other artists, either as a jumping off point or as something to copy outright. This particular painting is a detail, pretty much lifted and manually enlarged from one of Marshall's exquisite watercolors. Lately I've been working on an idea of developing other artists' drawings into finished paintings – especially drawings from previous centuries. It's a crude form of channeling, I guess. The painting is 28″ x 32″ – acrylic on canvas. 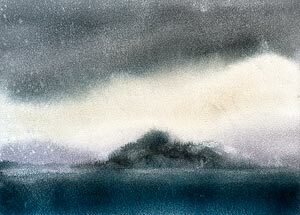 Here's a watercolor from the recently added Ireland section. It's possible to conjure images from realms of the imagination spun from emotional recollections — some of them harking back to previous generations. This isn't easy to prove by any conventional means, but the process has been a topic of conversation in many cultural settings for centuries. The practice of conjuring paintings in this way has suffered under more heavily conceptualized modes of artistic practice these days, but it deserves attention in the way that conventional apple pie deserves attention.